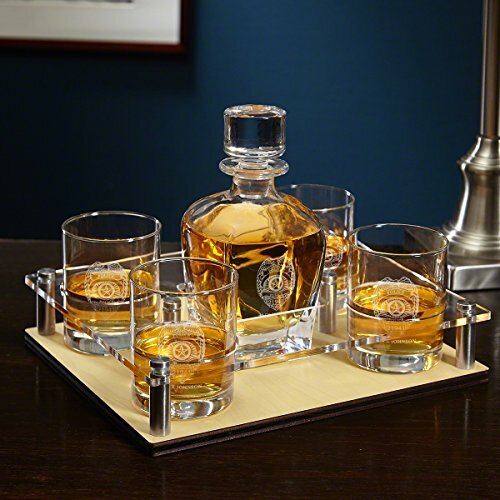 Police Badge Presentation Set with Decanter & Glasses by HomeWetBar | 6-Piece Set by HomeWetBar at Foom App. Hurry! Limited time offer. Offer valid only while supplies last. This personalized decanter and glassware set is the perfect gift for police officers because it is a symbol of hard work and dedication to quality. This personalized decanter and glassware set is the perfect gift for police officers because it is a symbol of hard work and dedication to quality. Our astounding 6-piece monogrammed barware set includes our Draper decanter, four Eastham glasses, and a handsome clear serving tray. With a base crafted from premium American birch, our presentation sets measure 12" x 10" x 2.75". The acrylic glass stand comes laser etched with a police badge design and the name and text of your choice. Ideal for carrying cocktails from one room to the other, or displaying your best glassware at home or the office. A matched monogrammed is also included on the 9" tall, 24-ounce whiskey decanter and four, 4.5" tall whiskey glasses. An unforgettable gift for policeman gift for any occasion from graduation to retirement. If you have any questions about this product by HomeWetBar, contact us by completing and submitting the form below. If you are looking for a specif part number, please include it with your message. By Regal Trunk & Co.